Baruntse (7,129m) Expedition in Nepal with Pink Mountain Treks and Expedition, climbing it or Baruntse summit popularity is increasing in recent years. Mt. Baruntse lies in the heart of Everest region surrounded by some of the famous peaks of the world, Mt. Everest, Mt Lhotse, and Mt Makalu, Chamlang, Amadablam and Mera peak in the Himalayas of Nepal. It is also one of the few peaks of this height with a high rate of success of ascent on normal route. The approach to the mountain follows the Mera Peak trek up to Mera La and then to Baruntse base camp (5,250m). The route is not technically demanding and essentially a straightforward climbing on snow and ice with some sections of over hangings. 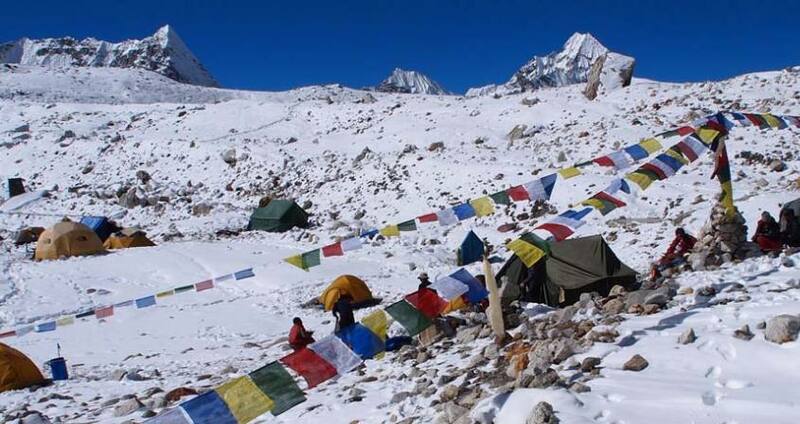 Normally, two high camps are established above the base camp for Baruntse climbing. The camp I is set up just below East Col. at an altitude of 5,700m and the camp II is on the South East Ridge at a height of 6,420m. Baruntse Expedition demands generally three camps to approach above the base camp for climbing. Pink Mountain Treks and Expedition's normal route is classic South-East Ridge for climbing. The summit from Pomori provides an excellent photography views of snowy mountains which will be a great perception for mountaineers.This mountain could become the most rewarding challenge in the Himalayan and offers other side beautiful views of Lhotse, Nuptse and Everest. Main summit route of Mount Baruntse is Southeast Ridge, Pink Mountain Treks and Expedition proudly offers mountaineering trip in Himalayan region. Basically we operates two types of Baruntse expedition services like trekking service up to base camp, base camp service and high camp full summit support service. Baruntse expedition cost depend on group size, trip types (full board/ up to base camp service), budget, tailored itinerary, accommodation (budget to luxurious), level of service above base camp, number of climbing guide, porter, other support staffs, mode of transportation and other factors. In this way price range for the Baruntse summit trip widely different, if you would like to discuss your requirements please e-mail us for up to date price for Baruntse summit. First successful summit of Baruntse peak was made by Colin Todd and Geoff Harrow on 30 May 1954. South East Ridge of Baruntse is little bit difficult because of being straightforward hard ways to climb. There are hard sections of 50 Degree’s elevation with a prominent ice cliff to be climbed facing the risk of avalanche, climbers have succeeded the mountain mostly in the spring season because of being the season the best to the climber safety. But also some climbers have reached on its top in the autumn season as well. Baruntse Expedition itinerary has been carefully designed to allow for gradual ascend and proper acclimatization by our expert climbing guide Sherpa. Best season for Baruntse Expedition is spring and autumn. Day 28Fly back to Kathmandu You can extend your trip in Nepal to explore the Jungle safari in Chitwan National park or Buddhist Pilgrimage trip to Lumbini, Birthland of Buddha or other part of Nepal's Trip or Can take your Flight to your destination.